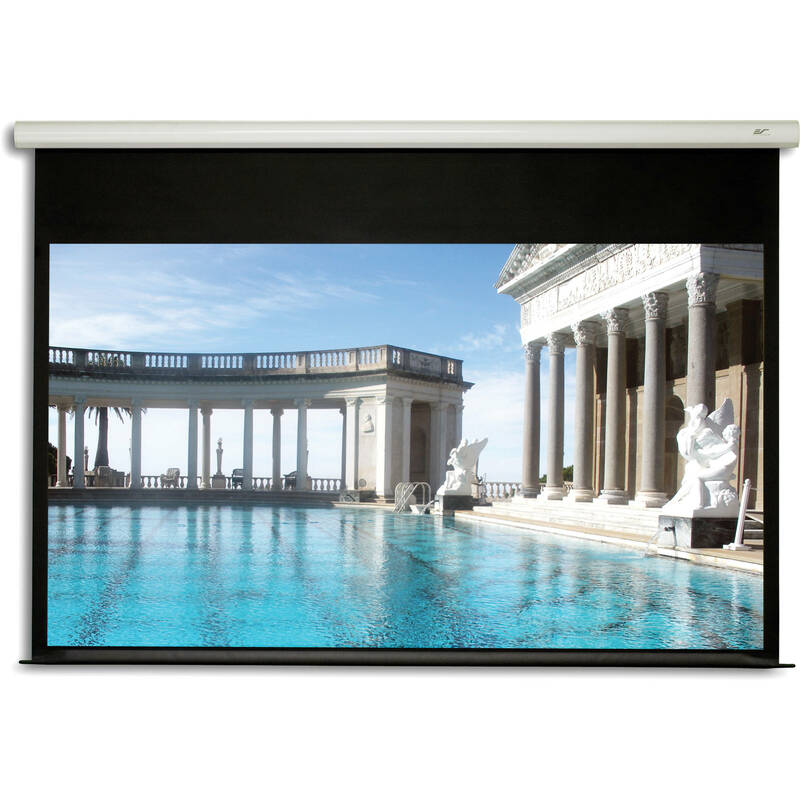 The 49.0 x 87.2" Spectrum2 Motorized Projection Screen with 12" Drop from Elite Screens features Plug and Play design, an aluminum casing with white enamel finish, and moisture and flame-resistant screen surface. The screen also comes with GREENGUARD certification assuring that the Spectrum2 has met strict emissions limits for construction materials and indoor use. Installation is straightforward and expedited by the included floating brackets that can be first secured to wall studs, and the screen aligned at a later date. There are also quick-release tabs that promote rapid set up and tear down. When the screen is hung from the ceiling, the 12" drop lowers the projection surface enough to provide neck relief, since it negates the need to tilt your head back to view the image. 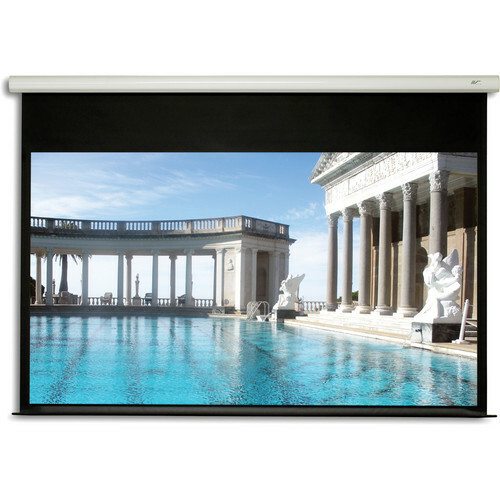 The 4-sided, 2.0" black masking borders help eliminate excess light from projector spill. The black backing on the material enhances contrast and prevents any backlit light source from intruding on the image. With a view angle of 160°, it's easy to see your projection from just about anywhere in the room. The tubular motor has a built-in 3-way up/stop/down switch and 3-prong, 11.5' power cord suitable for North American outlets. It also includes an auto cut-off in case of overheating. MaxWhite FG is a matte white surface designed for high-end DLP and LCD projection. It has a multi-layer weave with a textured surface reinforced with fiberglass for strength as well as providing uniform image diffusion. As a result of its construction, it resists warping. Color and contrast are precise. The black backing eliminates any bleed-through. It can be cleaned with mild soap and water. Box Dimensions (LxWxH) 99.0 x 6.5 x 6.25"
Spectrum2 Motorized Projection Screen with 12" Drop (49.0 x 87.2") is rated 4.0 out of 5 by 1. Rated 4 out of 5 by Ching from Nice screen. The screen is Quiet, and easy to setup/install. I did see any winkles or crease on mine. No remote included I think the optional remote kit ZPM-RT too expensive, $99 Some of the other remote is ugly and bulky, looks it was designed in 1960s.